» Is Turkish Coffee Stronger than Espresso? Do They Use the Same Coffee Beans? Do they Use the Same Roast? Do they Use the Same Grind Size? One of the oldest and ancient ways to brew a cup of coffee is the Turkish Coffee Preparation. Would you believe that people started brewing this coffee in as early as the 1500s? Actually, UNESCO even acknowledged the Turkish Coffee as an indispensable part of the Turkish Cultural Heritage. And the old Turkish proverbs describe Turkish coffee as "Black as hell, strong as death, sweet as love.". Which leads to this often asked question: Is Turkish Coffee stronger than Espresso? When comparing the strength of Turkish coffee and Espresso, we can determine the strength of their taste and caffeine content. If we will talk about the taste, then yes, Turkish Coffee is stronger than espresso. On the other hand, the Espresso wins if we measure the strength with the caffeine content. The Turkish Coffee and Espresso are both rich and flavorful, but they are different in so many ways. From the type of beans, grind size, preparation, and time of preparation, you'll learn that they are very different. Well, coffee drinking always depends on a person's preference, but it's better you know what your choices are. The answer here is both yes and no. It always comes down to preference and budget. Yes, technically we can use the same type of coffee beans and the coffee still taste differently because of the process they undergo. No, because there are types of bean that tastes better with a certain brewing method. Just to clarify, Turkish Coffee and Espresso are NOT TYPE OF COFFEE BEANS, they are types of the brewing process. ​It' the process of how you make your coffee. In Turkish Coffee preparation, most people usually use 100% Arabica beans. Because this kind of coffee plays an important role in Turkish weddings, we want nothing short of excellence. It is said that in a Traditional Turkish wedding ceremony, the bride-to-be prepares a Turkish Coffee for the groom and the groom's family when they ask for the blessing of the bride's parents. And on this occasion, there are two things that matter: how the bride-to-be makes coffee and how the groom-to-be drank the coffee. It is the time that the groom-to-be's family can criticize the bride-to-be's coffee making skills. The bride-to-be can actually be rejected by the groom-to-be and his family for poor coffee making skills. So, she serves them really good-tasting coffees if she wants to be accepted. Thus, the use of 100% Arabica beans. On the other hand, the bride-to-be can use salt instead of sugar during the coffee preparation to test the character of the groom-to-be. They said that if the bride-to-be added too much salt, she probably doesn't like the groom-to-be that much. Or she doesn't want to get married yet. However, if the groom-to-be finished drinking the cup of coffee without any complaints, he's perceived to have a good character. And it's a sign he's ready to marry her. Also, Turkish coffee is a known tool for fortune telling. There's also a tradition about it, which makes Turkish Coffee very valuable. Though modern people no longer do these traditions, it's still fascinating to learn more about it. And they explain why Turkish Coffee requires high-quality coffee beans. By the way, most people use Brazilian coffee beans and Arabian Yemen Mocha to make Turkish Coffee. But any type of coffee bean will do. Though espresso coffee isn't an ancient as the Turkish coffee, it still plays a huge role in a world of coffee. It started in the 1900s in Italy and Espresso Machine is one of the innovations during the Industrial Revolution in Europe. During those times, Italians do not want to pay much for their espressos, which made the coffee houses mix espresso blends with Robusta coffee. That's why until now, most espresso blends contain approximately 20% of Robusta beans. Most people use coffee beans from Brazil, Indonesia, and South and Central America in making espresso blends. Just like with the type of beans, the answer here is both yes and no. Also, the type of roast has nothing to do with Turkish coffee stronger than espresso debate. Darker roasts may have a heavier body, but the roast type has nothing to do with the strength of a coffee. Most coffee drinkers prefer to use dark roasts for both the Turkish Coffee and the Espresso. And yes, you can use any type of roast, as you please. After all, it's you who will drink this coffee, so go ahead and choose what you like! However, with espresso, most of the blends you can find on the supermarket are of dark roast. To be specific, espresso uses Italian or French Roast. And even k-cups or pods used in super automatic espresso machines usually come with dark roast coffee grounds. On the other hand, the coffee drinker can experiment more with the Turkish coffee preparation. There are actually some people who prefer to use Light Roasts for their Turkish Coffee. Because when you use a lighter roast, it gives off more aroma, and the flavor profile of coffee is still very recognizable. Again, this will just boil down to the coffee drinker's preference. The answer here is simply NO. The Turkish coffee uses finer grind size compared to espresso. If you ever heard of the terms "Turkish Grind" and "Espresso Grind", you'll already have an idea. Well, just to clarify, Turkish Coffee and Espresso are not types of grind, too. Some people, probably marketing, associated the name for easier recognition of the grind size. For Turkish Coffee, we use the finest grind size available, that its size becomes comparable to the texture of a flour. The unique flavor, body, aroma, and texture of Turkish coffee are because of this very fine grind. The powdery grind size of this coffee allows for the dissolution of soluble solids, making this very flavorful. Also, the Turkish grind makes the brewing process really fast, though not as fast as espresso. If you will use a coarser grind size, you might not achieve the desired Turkish Coffee outcome. So, if you calibrated your grinder to grind for your espresso, you'll have to adjust it to grind finer. This might take some practice, but the Turkish Coffee experience is definitely worth it! Compared to Turkish coffee, an Espresso coffee uses a fine grind (coarser than Turkish coffee). To help you understand, the grind size for espresso should be finer than sugar but coarser than flour. Unlike with the type of beans and type of roast where we can experiment, the grind size is very specific. There's very little room for adjustment in making espresso, you can't use a coarse grind just because you want it. The grind size of coffee beans greatly affects the extraction time for espresso. Of course, we only want to drink a good shot of espresso, and we can achieve that by having consistency. So, to achieve consistency, we need to get the right grind size of coffee beans. If you use a coarser grind, your espresso will drip too fast, which will give you a weak coffee without crema. While a finer grind will make your espresso drip slowly resulting in a very bitter and over-extracted espresso. Both are bad shots of espresso. The extraction process is the main difference between the Turkish Coffee and the Espresso. It's actually the extraction process that makes their taste very different even if you use the same coffee beans. Let's go ahead and find out how different is the extraction process of Turkish Coffee from Espresso. To start the extraction or brewing of a Turkish coffee, we will need to have an ibrik. An Ibrik is a Turkish Coffee Pot, made from thick copper with a wooden handle. Then, you will need to put the desired amount of water in the Ibrik before placing it on top if the stove, with medium to high heat. After that, you will add the coffee grounds, approximately 1 Tablespoon of coffee grounds per 3 ounces of water. Though you can always put more or a lesser amount of coffee grounds depending on your preference. When you add the coffee grounds, you'll notice that they will just float on top, do not stir it. When you already added the sugar, it's time to stir it multiple times and lower down the heat. You need to stir the coffee until the sugar completely dissolves. After stirring it, you will notice that there are microbubbles forming on top of your coffee. This time, you need to lower the heat again to avoid boiling your coffee, or else it will have a burnt taste. Remember that the foamier your Turkish coffee is, the better. So allow your coffee to foam but make sure it will not boil. And after all this step, you have to pour the Turkish coffee in a demitasse, small cups (3 ounces). Then you have to let it sit for about 90 to 120 seconds before you can drink it, to let the coffee grounds settle. And unlike with French Press, there's no need to filter out the coffee grounds. It's part of the Turkish coffee experience, and it's important for the fortune telling. So, when you drink a Turkish coffee, you leave out the last sip to avoid consuming the coffee grounds. A Turkish coffee is usually served with a glass of water (to cleanse the palate of the drinker) and a Turkish delight. Compared with the Turkish coffee, most coffee drinkers are familiar with the extraction process of an espresso. If the Turkish coffee only needs an Ibrik and a source of heat, espresso needs an espresso machine and a portafilter. Considering we talk about semi-automatic espresso machines because the modern world offers fully automatic ones. In espresso making, we start by warming up the espresso machine and placing our coffee grounds into the portafilter. Then, we tamp the coffee grounds until its surface becomes even and flat. After that, we place the portafilter int the group head of the espresso machine, and once it's properly placed, we start the brewing process. To extract the espresso, an espresso machine needs to have at least 9 bars of pressure. The pressure makes the brewing process shorter, thus making it ideal for commercial use. Ideally, the espresso drips for about 20-30 seconds only. Anything less than that is an under extracted espresso with a thin and light body. And anything more than 30 seconds is an over extracted espresso with a burnt and bitter taste. An espresso can be drunk on its own, or it can be used as the base of cappuccino or latte. When comparing Turkish coffee and espresso, we can find similarities and differences. They both can use any type of coffee beans and roast. However, they will still have very different taste and flavor profile because they are brewed differently, even if we use the same coffee beans. 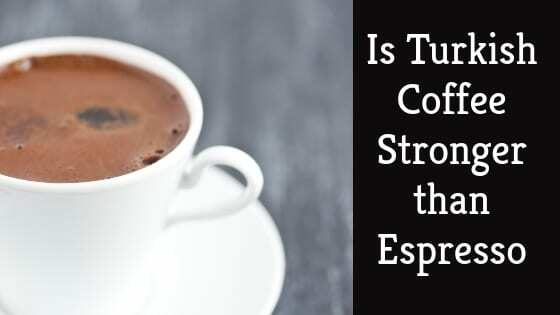 And since we talk about differences, this article already answered the question if Turkish Coffee is stronger than Espresso. If we talk about the taste, it's a yes, because Turkish coffee brews longer, thus extracting more flavors. But if we talk about the caffeine content, espresso is stronger than Turkish coffee, it has more caffeine. Overall, Turkish coffee drinking is an indispensable part, not only of Turkey but of the world of coffee. I hope you get to know more about your favorite morning ritual, I'd love to hear your coffee traditions in the comment section!